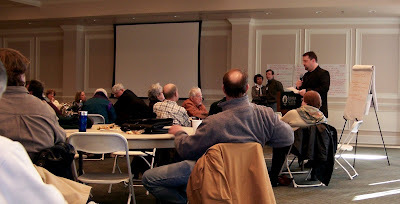 Most of Delaware's environmental advocacy organizations were represented yesterday at the environmental summit in Dover. The Delaware Chapter of the Sierra Club, Delaware Audubon, the Delaware Nature Society, Citizens for Clean Power, the Christina Conservancy, Inc., the League of Women Voters, Greenwatch Institute, the Delaware Environmental Network, the Clean Air Council, Delaware Riverkeeper, Surfrider Foundation, Center for the Inland Bays, Climate Prosperity Strategies, Global Urban Development, the Widener Environmental Law Center and more came together, along with a number of interested businesses, to discuss policy priorities for the coming year and explore ways to work together. The idea for this gathering grew out of the alliance forged in the effort to bring offshore wind power to Delaware. On December 18, 2007, the Public Service Commission and other regulatory agencies were effectively blocked from approving the power purchase agreement. After a few short minutes, wind power advocates emptied into the hall, wondering what to do next. After meeting in a lounge on the Wesley College campus, we secured a classroom upstairs where we discussed what to do next. We listened as everyone offered suggestions as to how to proceed. The strategy for winning legislative approval for wind power was hatched in that room. We put every idea up on the board. The ideas we implemented from that session led us to eventual success. Within a month, 29 legislators signed on to a resolution to approve the project, and within six months the General Assembly unanimously passed a bill to make Delaware the first state to approve offshore wind power in the U.S.
We hope to duplicate that success and use the ideas raised to help build closer working relationships among Delaware's environmental activists. We plan to issue a report from the summit in two weeks. I do not understand why the summit excluded two of your --very few--environmentally-friendly elected officials. Now that we are public officials are we outsiders? It was difficult to tell committed environmentalists like Joan Deaver and John Kowalko to sit this one out. We did so because we wanted to focus on one task, that of organizing, and thought that including elected official would distract from that. Many particpants talked about the need to control suburban sprawl and protect Delaware's inland bays. As a new member of Sussex County Council, Joan deserves the support of environmental activists up and down the state in her effort to keep developers from steamrolling the Council and paving over the pine woods, farms and wetlands of Sussex County.